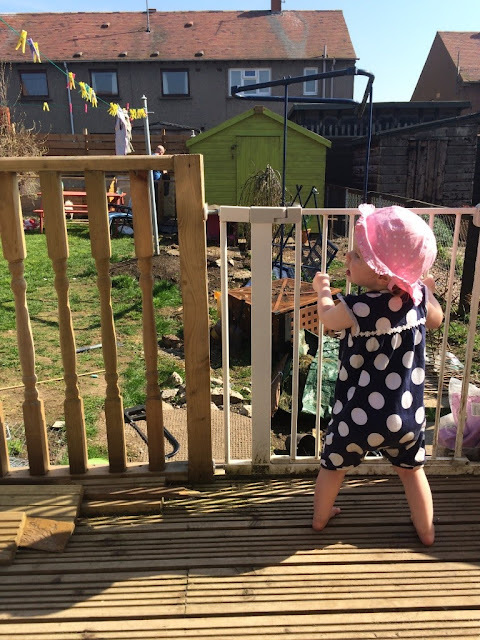 Getting a child used to lots of different experiences is something that is important to us and so with the nice weather we have been getting out and about seeing, hearing and feeling things that are new to M.
Grass is not going to hurt you! As I said yesterday M has not been keen on touching grass, she would jump out of her skin if it as much as brushed her skin so because it was sunny weather again today and me and hubby were out digging out and tidying the garden we thought we would try again. At first it was a no-go. She would crawl to the end of her rug and stop so we got her a ball, which she loves to throw about, and let her go and chase after it if she had thrown it off the rug. At first she was unsure and whined for us to go and get it for her but she quickly realised that she wasn't going to get her way and had to get it herself. So off she crawled, toes curled up so they didn't touch the grass but hands well and truly on it. Sand is fun to play with in the sun! Earlier in the morning I had taken out the sandpit which she completely ignored. 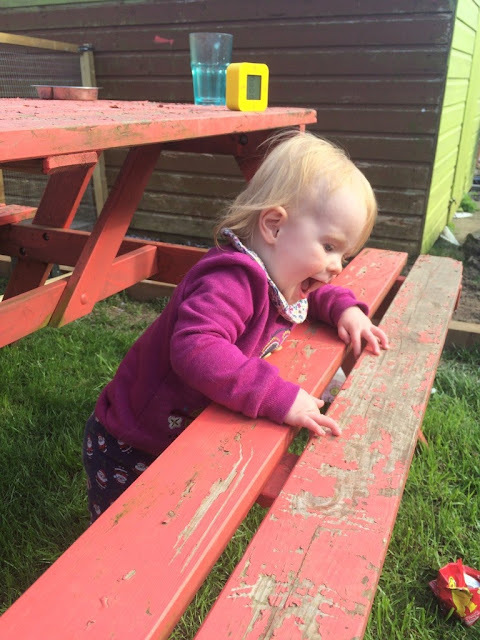 This was another sensory activity that she wasn't keen on previously. 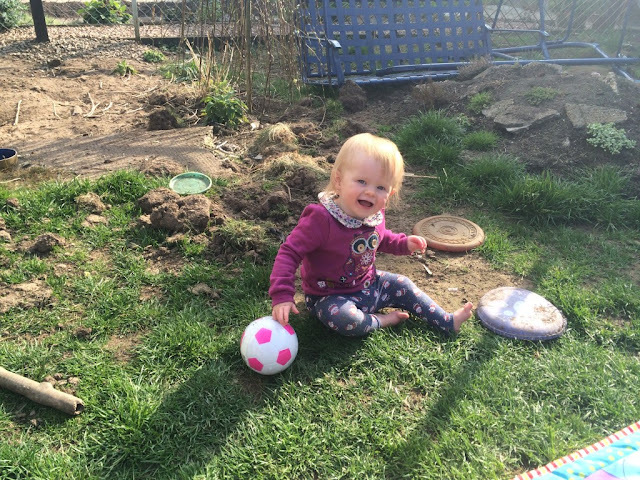 Again she had been playing with a ball so I put it in the middle of the sandpit so she would have to get it. She still refused but when I lifted her in and put her down she stayed in for a long while which is a step forward for her. We have got her some tools to use in the sand so will try again on the next nice day. Cows go moo and smell so bad! After tea we went for a long walk in the countryside with the dogs and went past the dairy farm with hundreds of cows in the pens. This was a perfect excuse to introduce M to cows, which she loved looking at, and allowed her to hear the moos of the cows close up and, on a not so great note, the smell of the cows! It was a perfect way to round off a perfect day. Sadly the weather it not meant to stay as nice but hopefully it won't be long until we get out and about again. 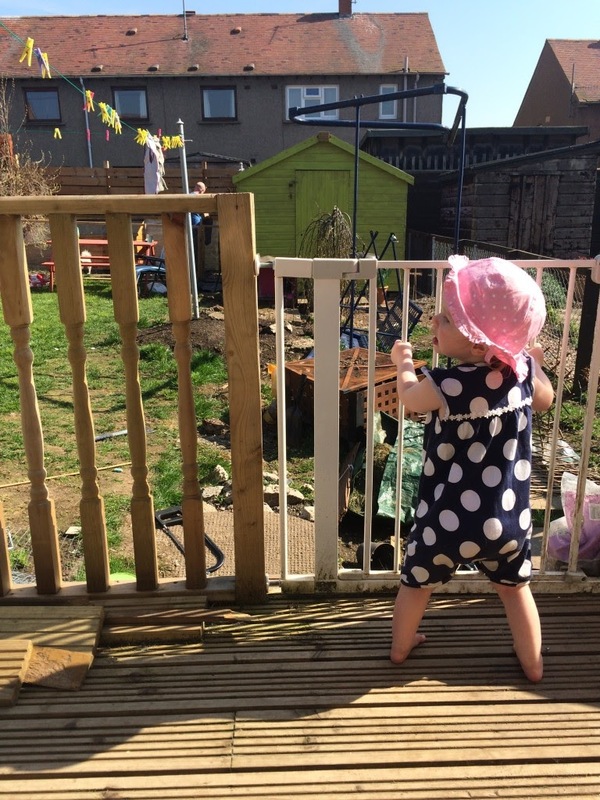 Next year we will have two little people to play in the sun with. I really can not wait. Alexander loves grass, he did last summer too. I'll need to keep an eye on him this year because he just loves to put things in his mouth that he shouldn't. Haha! It sounds like your little one has come a good way with grass, it is great that she is clearly loving it now based off the picture!